Looking for something MINI to do in September? Head to Northern California and watch some racing! 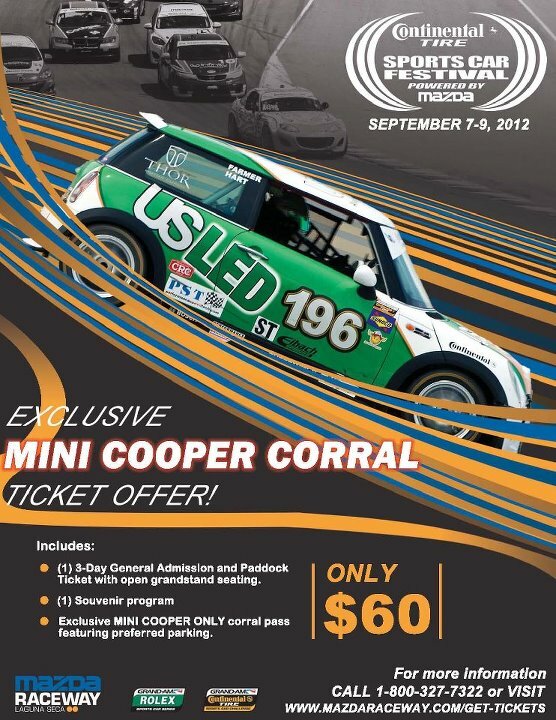 Shasta MINIs has setup something very special for the Grand-AM/Continental Championship races at Laguna Seca. >We have set up a Mini Cooper Corral for the Grand-AM/Continental Championship races at Laguna Seca Sept 7-8-9, 2012 in Monterey California. RSR Motorsports will be running their R53 Mini Coopers in the ST Class. This will be the only time they will be competing on the west coast, so please join us to root them on. All MINI/Minis are welcome whether you belong to a club or not. The Continental Tire Championship race will be at 2:30PM on Saturday, prime time to enjoy the weekend. We are also told that Brad Davis and his son Robbie will both be competing in the MINI of Charleston MINIs in the Total Performance Showcase, possibly in that super hot B-Spec MINI we saw during MTTS!